Press Release- Conor McGregor has been suspended for a month on medical grounds after his UFC 229 defeat by Khabib Nurmagomedov. 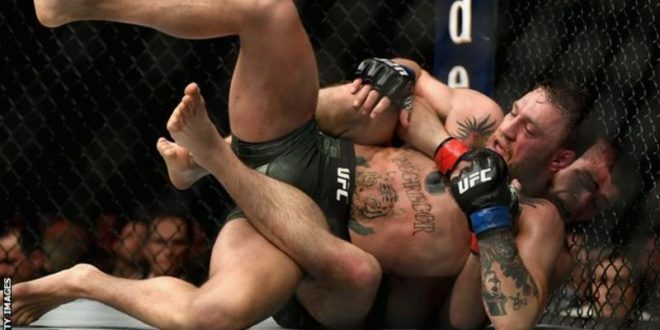 McGregor was beaten in Las Vegas when he tapped out in the fourth round following Nurmagomedov administering a rear-naked choke. Nevada State Athletic Commission (NSAC) sanctioned the bout and confirmed McGregor was suspended from fighting until 6 November, with no contact until 28 October. Medical suspensions are routine in UFC. In total, 13 fighters on the Las Vegas card have been suspended from action under medical grounds. Following the fight, there were violent scenes involving the fighters. Lightweight champion Nurmagomedov vaulted the cage and fought a member of McGregor’s team. Meanwhile, McGregor was involved in a bust-up in the octagon with members of his Russian opponent’s team. Three of Nurmagomedov’s party were arrested but later released, with McGregor refusing to press charges. Nurmagomedov’s fight purse has been withheld while the NSAC investigates. The Russian apologised following the incident but cited pre-fight trash talk in which McGregor “talked about my religion, talked about my country, talked about father”.